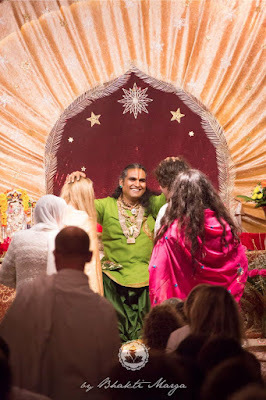 As we all know, It is a great honor to be able to have the Darshan of our Gurudev, and we are very, very fortunate that he allows it so frequently and gives it so tirelessly to us here at Shree Peetha Nilaya. Our new system of registration for Darshans has been an attempt to ensure a more comfortable experience for everyone. With these limited registrations, the Darshans have been shorter in duration and everyone has been able to fully participate without it becoming a marathon event for anyone, including other devotees, musicians, resident staff, and Guruji himself. Unfortunately, what we’ve found is that more and more devotees are registering and then failing to show up--without notifying us to cancel in advance. That means that some Darshans are considered fully booked when, in reality, there is space available and more people could have attended if only they had known. This is not fair to anyone and has caused disappointments all around, so we are beginning a new policy: If you sign up for a Shree Peetha Nilaya Darshan and fail to show up without cancelling in advance, you will not be allowed to register for Darshan for another 3 months. This list and these consequences have been put in place with the hope that it will help everyone take more seriously the privilege of coming to Darshan to receive the blessing from Guruji. Of course, if you have registered and your plans change, all you need to do is contact our office (events@bhaktimarga.org) and your space will be released allowing other devotees to register and come to receive the blessing from Guruji. We please urge you to do that as soon as know you cannot attend, and at least 24 hours in advance, so that you don’t risk a 3-month penalty. This policy begins immediately, so please give Guruji (and your fellow devotees) the courtesy of releasing your reserved space if you cannot attend Darshan at Shree Peetha Nilaya.